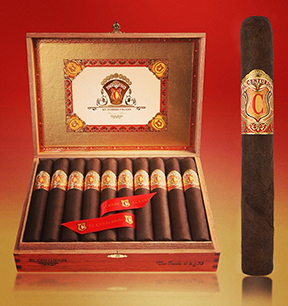 Don Pepín Garcia introduced the original El Centurion cigar in 2007 as his first limited edition run. It sold out very quickly and was considered by many to be some of his finest blending work. To celebrate the 10th Anniversary of Pepín's early days in the United States with El Rey de los Habanos, the El Centurion brand was resurrected and released in May 2013 by My Father Cigars as a regular production cigar. Though this El Centurion is also an all-Nicaraguan blend, the formulation is not the same as the original. Just as special in its own right, however, this medium- to full-bodied, medium strength puro is blended with Criollo, Corojo Habano, Sancti Spiritus, and Criollo '98 fillers and binders, and then finished in a beautifully aged Nicaraguan Habano leaf. The El Centurion offers superb construction, great complexity and balance, and flavor notes ranging from sweet and creamy to bold and spicy.